In-Stock Music Orders Over $49 SHIP FREE Within The Continental U.S.
DSD file created by Gus Skinas from the original Sony Super Audio CD cutting masters. In most cases, our DSD offerings are identical to original DSD data used to create the SA-CD masters. In essence, they are first generation SACD master audio. As a result, DSD audio levels conform to the MaxPeak specification as defined in the SA-CD Scarlet Book. It is possible that some titles reach, but do not exceed the MaxPeak limit which is about 3dB over 0dB-SACD. So it is possible that levels can be 3dB higher than the PCM limit. Most DSD capable playback equipment conforms to this specification. In the case where the DSD playback system does not meet the MaxPeak specification and distortion is heard, it might be necessary to lower the level of the DSD file with DSD processing tools such as Audiogate from Korg. 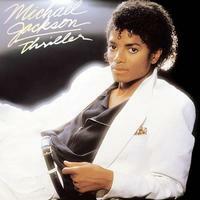 Released November 30, 1982, Thriller would go on to break all sales records while garnering a record seven Top 10 singles and 12 Grammy nominations. It remains one of only three albums to stay on the Billboard 200 Top 10 for one full year. What is impressive is Jackson's range of musical expression, one that touches the schmaltzy pop of Paul McCartney his duet partner on "The Girl Is Mine" on one side and the hard rock of Van Halen whose guitarist, Eddie Van Halen, is heard on "Beat It" on the other, with plenty of mainstream rock pop and dance music in between. It is no accident that the record found a home in so many record collections there is good music here for everyone. Customer Reviews (5.00 Stars) 11 person(s) rated this product. I agree with these other reviewers. The DSD version of this is one of the best quality recordings I have ever heard. Unbelievable. That BASS! Goes right inside ya! This is the album by which all other hi res recording should be measured! I have so many versions of this album and this one is just AMAZING. Thanks for making it possible! My first DSD music download for my new Astell & Kern DAC and I'm very happy with the DSD format version of Thriller. It sounds fantastic. Will probably pick DSD for future downloads if the reviews are good. I hope my future downloads sound this good. This will make a believer of anyone! Jaw-dropping sound on every track. Too many great things to list here about these recordings but it was like hearing them for the first time for me. Few artists are capable of rewarding listeners with such complex precision and perfection while making it sound warm, natural and effortless but MJ does it over and over and never sounding better than these recordings. Out of all I got to say I'd pay big bucks to have a quality this good, streamed not upscaled, right through a dedicated Internet line for its sole purpose to Play Acoustic Sounds Super HiRez(Tm) files in DSD format. - On a side note, people should invest, occupy, study, and live this way of sound - there's really nothing else like it besides front row seats - I encourage gamers to get involved with quality life it may just lead you to happiness. I have several versions of this release - but none of them come even close to the DSD version. It is my very first purchase of DSD and from all the reviews I have read on various forums, figured this would be a good start. The music is up front and clear, while Michael's voice is detailed. I've heard things in this version that I had never heard before, or was aware of. I'm listening to it via USB in Native DSD throug a SIMAUDIO AMP / DAC with Audioquest Nighthawk headphones. Loving it! The only thing I notice on the opening to the Billie Jean track is what appears to be "skips" - stops and starts - and not sure if it's the actual file or JRiver Media center. Will need to check it out - otherwise, a great listen. A fantastic sounding album release! After reading a couple of the favorably strong reviews on here, I decided to buy this DSD version of Thriller. I was very impressed by how much better it sounded than the mp3 versions of certain album tracks that I had. The sound was more clear, the bass sounded deeper and tighter, and overall the sound was noticeably improved! I would definitely recommend buying this DSD release! Even though I already had the 24 bit 88.2khz version that I downloaded from HDTracks.I decided to get the DSD version because it was the 31st anniversary of this album's release(November 30 1982)WHAT A DIFFERENCE!!!! The DSD file sounds WAAAAAYYYYY BETTER! GOBS more detail and vocal presence. HUGE soundstage.I thought the jump from CD to 24 bit was big.That ain't nothing compared to going to DSD. The bass on Billie jean is UNBELIEVABLE! Write a review and let people know what you think of this product OR just rate it. © 2019 Acoustic Sounds, Inc. All rights reserved.